Just like when you were a kid! Can't get enough of this childhood favorite? Who could blame you? Spam tastes great with everything! Check out these simple Spam recipes that would definitely make you fall in love with this versatile grocery find all over again. No Pinoy week is complete without a nice plate of tokwa't baboy. But instead of using pork, upgrade your tokwa't baboy recipe by using SPAM® Less Sodium. 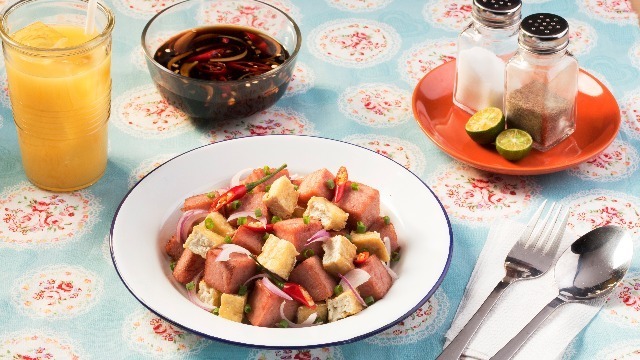 You can still enjoy the delicious goodness of tokwa't baboy, without all the salt. It goes great with a cup of steaming rice for lunch or a bowl of hot lugaw for merienda. You can also enjoy it as it is, with some refreshing drinks on the side. 1 Prepare sauce, by mixing all ingredients together. Set aside. 2 Preheat oil to 370 degrees Farenheit. 3 Deep fry cubed SPAM® Less Sodium and sliced tofu. 5 Cut fried tofu into cubes. 6 Toss SPAM® Less Sodium, tofu and sliced red onion together. 7 Top with red chili and spring onion. 8 Drizzle with sauce mix and serve more on the side. The secret to a wonderful day is a filling breakfast—so what better way to start the day than a nice helping of Spam. 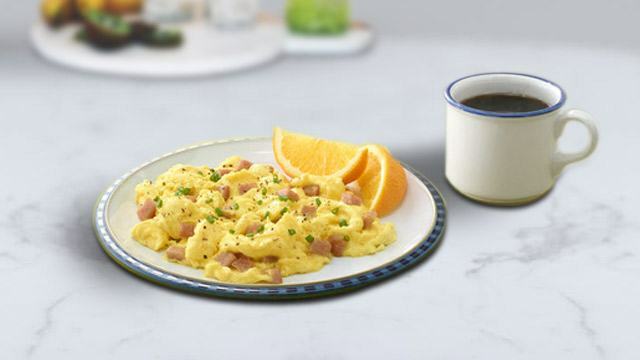 Take a batch of hot pandesal, fry up some fluffy scrambled eggs, throw in Spam in the mix and you've got yourself a delicious treat that you'll surely look forward to every morning. Spread mayo or catsup (if desired) on bun heel. Place lettuce and sliced tomato. Add pan-fried slices of SPAM® Classic. Top with bun. Serve warm. Craving for some Japanese tonkatsu? Would you believe you can make this delicious dish using a can of Spam? It's all in the breading—and Spam is flavorful enough, you don't need to add anything else. Check out this recipe! 1 Preheat oil to 375 degrees Farenheit. 2 While waiting for the oil, prepare SPAM® Black Pepper. 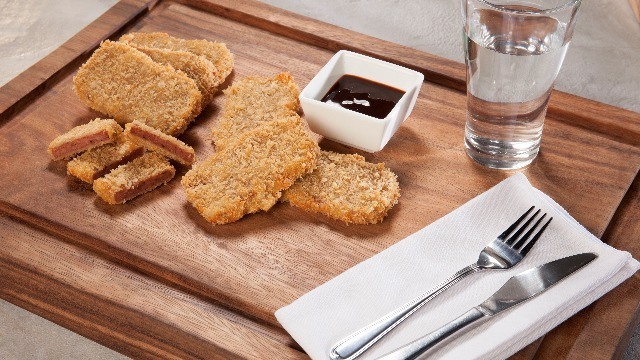 3 Dredge SPAM® Black Pepper slice in flour, dip in egg and then coat with bread crumbs. 4 Deep fry in oil for 3-5 minutes or until golden brown. 5 Serve warm with sauce on the side. If you're looking for something sweet and salty for lunch (or dinner), some caramelized Spam might just be the recipe you're looking for. This Spam recipe using SPAM® Hickory Smoke has a delicious smoky, sweet, and salty flavor that is sure to satisfy your creavings! 1 Heat oil and pan fry cubed SPAM® Hickory Smoke, set aside. 2 In the same pan, heat oil and sauté onions and bell peppers. 3 Add in sugar and soy sauce, caramelize and add in Worcestershire. 4 Turn off fire and add back pan fried SPAM® Hickory Smoke. 5 Toss well to coat and top on rice. Another classic breakfast recipe that would bring you back to your childhood! Except this time, you'll be making it yourself (not your mom) and you can have it any time of the day. This recipe is also great if you're in a real hurry—just open a can of Spam, add some fresh eggs, fry in oil (or butter) and you're all set! You can even bring some to work. 1 In bowl, whisk together eggs and milk. Set aside. 2 In greased skillet, cook egg mixture over medium-high heat, pulling with spatula to allow liquid to contact skillet surface, until desired doneness. 3 Add SPAM® Classic to skillet. 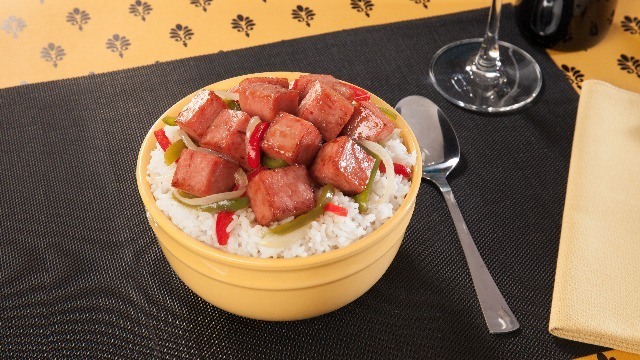 Reduce heat and gently stir mixture until SPAM® Classic is heated thoroughly. Garnish with chives.